Feline Leukaemia Virus is highly contagious and easily spread, though cats who are infected may show no signs of the disease for months or even years. The disease slowly weakens the immune system, exposing the cat to other life-threatening ailments like kidney disease and cancer. There is a vaccination against FeLV. Kittens, cats that have access to the outdoors, and cats living in a home with an FeLV-positive cat should be vaccinated. Test for FeLV before vaccinating, and before adopting a new kitten. The test is a simple blood test and results come back fast. If the cat tests positive, it is important to keep them indoors to reduce the risk of spread. 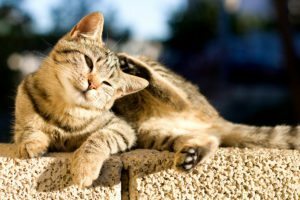 An FeLV-positive cat should also see the vet every six months, be sterilised, be treated for internal and external parasites (worms, fleas, ticks) and have their vaccinations for other diseases. An FeLV-positive cat will live on average for 2,5 years. If you know your cat is FeLV-positive, please alert your vet. She will probably perform additional tests to establish how sick your cat is, what the prognosis is and what treatment your cat needs in the future.